This disc contains motets by Italian composers from the 16th to the 20th century written for jubilees, but the liner notes don't tell us which jubilees. There is also no information about the choir; apparently it is the choir of a French church in Rome. 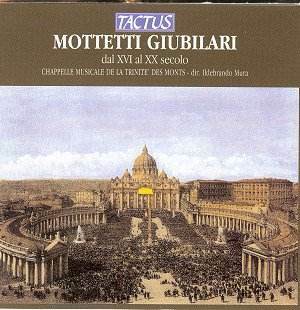 That may be concluded from the words of the 'First councillor to the French Ambassador to the Holy See', Laurent Stefanini: "I hope that this CD will make the French religious establishments in Rome and Loreto, whose 500th anniversary we are celebrating this year, better known." This disc may contribute to them being better known, but I doubt if it is going to enhance their reputation. To be honest, this is by far the worst disc I have ever heard. I really can't mention a single aspect which could make it recommendable. First of all, the repertoire may span about four centuries, there is not that much difference between the 20th century motets and those of previous centuries. And if there are any differences, one doesn't notice them from the performance by the choir, which is very old-fashioned. The tempi are almost always the same, the choir which consists of 12 singers (4/3/3/3) produces a thick and muddy sound and the lyrics are very hard to understand. Secondly, the quality of the recording is below any modern standard. The spatial acoustics don't make it easier to understand what the choir is singing, but the way the reverberation is cut off at the end of every piece - and sometimes after a section of a piece - is simply unprofessional. The two organ pieces on the disc are even faded in, something I have never heard on any professional recording before. And on the basis of the sound one could think this is a mono recording. From the second track onwards there are some strange noises which suggest the disc is technically deficient. That is quite unbelievable, but considering the overall quality of the recording it doesn't really matter. Nor does the fact that Tactus has made a complete mess of the track-listing in the booklet and on the tray. Hardly any piece is given its correct track number. The list given at the top of this review is the correct one. If possible I would give Tactus the 'Prix de Citron' for this release. The producers really should be ashamed of themselves.